We managed to take in one last historic site on the final day of the trip: Point State Park in Pittsburgh, PA. Although it’s not as well known as Bunker Hill or Independence Hall, it’s one of the most important pieces of real estate in the history of North America. 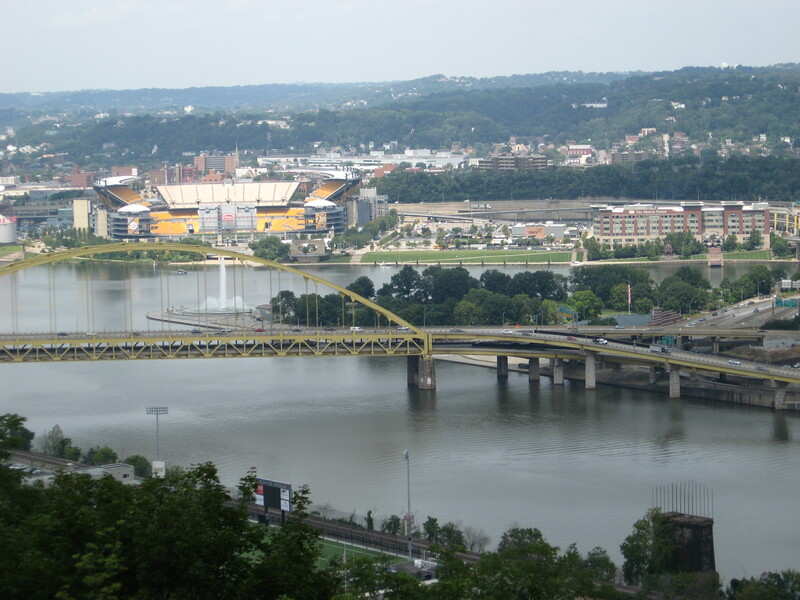 The struggle for this triangle of land at the “Forks of the Ohio,” the juncture of the Allegheny and Monongahela Rivers, shaped the destiny of an entire continent. Control of the Forks meant command of the Ohio River, which also meant command of the continent’s vast interior. Both France and England acted on this realization about the same time, which is why in 1753 Virginia’s royal governor sent an inexperienced young officer named George Washington to tell the French that the Pennsylvania frontier was British territory. 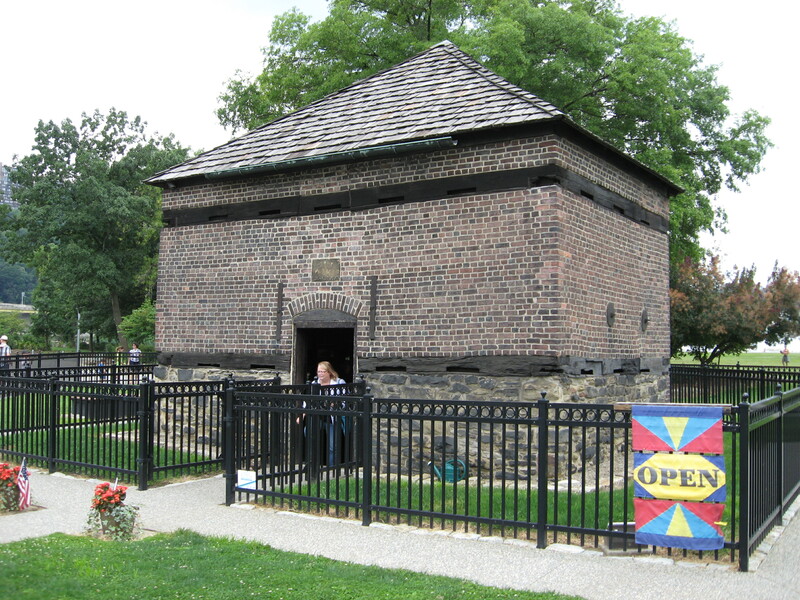 Unimpressed, the French proceeded to drive away an English crew building a fort at the Forks and then constructed their own outpost at the site, naming it Fort Duquesne. In 1754, Virginia sent Washington back to the Pennsylvania frontier to kick the French out. This expedition, of course, culminated in the messy and controversial confrontation at Jumonville Glen and an embarrassing defeat for the inexperienced officer at Ft. Necessity. These proved to be the opening moves in the French and Indian War, so it was the struggle for the Forks of the Ohio that launched the war which resulted in the transfer of France’s North American mainland empire to Britain. For the first few years of the French and Indian War, the French managed to hold on to Ft. Duquesne and the Forks. Gen. Edward Braddock’s 1755 expedition to Duquesne was wiped out before getting a chance to threaten the fort, and another effort faltered in Sept. 1758. The English finally succeeded in driving the French away from the Forks that November. They built their own fortification very near the site of Duquesne, naming it “Fort Pitt” after the popular English politician. This fort—quite a bit larger than its French predecessor—was one of the most substantial defensive works in colonial North America. When the war ended in 1763, Indians along the Great Lakes and Ohio frontiers revolted against the new English masters of the interior, disgusted at British attempts to restrict trade and gift-giving. The outbreak of Pontiac’s Rebellion saw Ft. Pitt and other outposts along the frontier under siege by these irate warriors; the fort’s commandant attempted to break the encirclement using smallpox-infected blankets, but the Indians ultimately broke off the siege themselves to intercept a force coming to Pitt’s relief. The site continued to play an important role as a staging ground for colonial forces in Lord Dunmore’s War, and then for American forces operating in the West during the Revolutionary War and the Whiskey Rebellion. Of course, there might not have been a Revolutionary War if Britain hadn’t tightened its grip on its American colonies after winning the French and Indian War. Since it was the cost of that war which prompted Britain to tighten its grip in the first place, it wouldn’t be too vast an oversimplification to say that if England and France hadn’t disputed mastery of the Forks of the Ohio, American independence wouldn’t have happened when and how it did. It would therefore be pretty hard to overstate the historical significance of this piece of ground at the meeting place of three rivers. Unfortunately, the forts which once symbolized these nations’ commitments to control the Ohio River Valley are pretty much long gone, but there are still some features worth seeing at the Point. A brick outline marks the site of Ft. Duquesne, and an outbuilding of Ft. Pitt called the “Blockhouse” is extant and open for tours. Built in 1764, it’s probably the oldest surviving building west of the Appalachians. 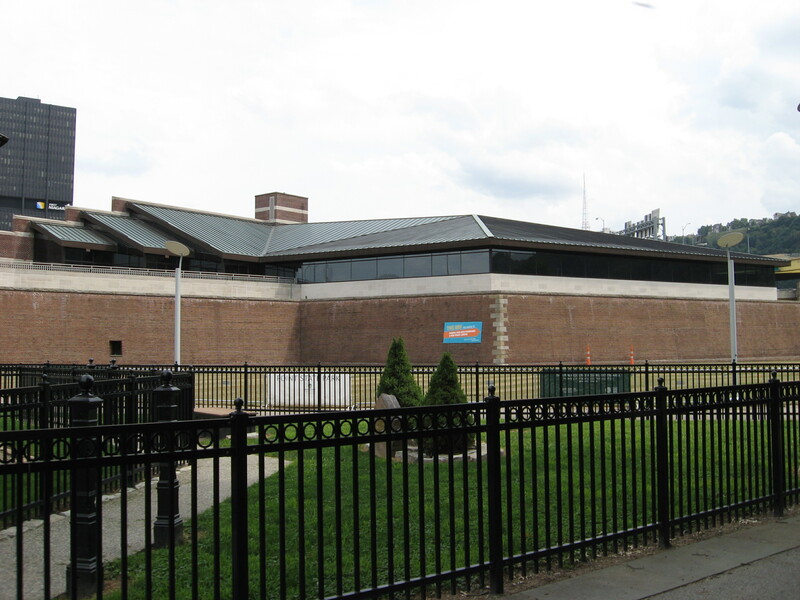 In addition, one of the bastions of Ft. Pitt has been reconstructed and houses the Fort Pitt Museum, which is run by the John Heinz History Center. I highly recommend a visit to the museum. The exhibits deal with the struggle to control the Forks of the Ohio before and during the French and Indian War, as well as the important role Ft. Pitt played in the Revolution and into the early national period. There are some fantastic military artifacts to see in the galleries, and the gift shop has a great stock of books on the French and Indian War and the early history of western Pennsylvania. 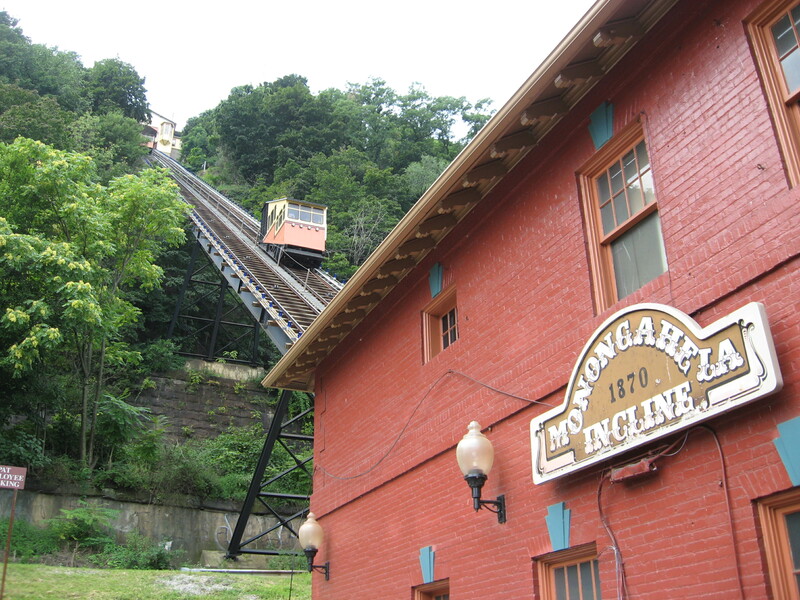 You can get a beautiful view of the Point—and of Pittsburgh as a whole—by taking one of the historic incline railways up to the heights overlooking the city. Built in the late 1800’s for immigrant laborers who lived on the mountains above town, there are two of them in operation today. The fountain in the left center of this photo marks the spot where the rivers flow together into the Ohio, right in front of Heinz Field. Now I want to get back up to western Pennsylvania and see Fort Necessity, the Braddock battlefield, and the Carnegie Museum of Natural History.